This post originally appeared at the Religion in American History blog. 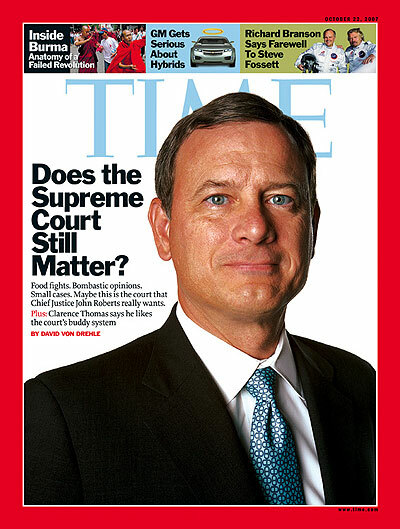 The Roberts Court turns ten on Monday. With a new term about to begin, I thought it would be helpful to preview upcoming cases that might be of interest to readers of the blog. The previous term provided no shortage of data for scholars interested in the legal construction of religion in the United States (most notably in Greece v. Galloway and Burwell v. Hobby Lobby), and this term promises to continue that trend. Last term witnessed an increased emphasis on the protection of religious exercise, and it is clear that the Court will continue dealing with similar issues in the months ahead. Instead of looking at religious corporations, though, the Court will be dealing with prison law and, well, Abercrombie and Fitch. Both of these cases involve the religious exercise of American Muslims, and it will be interesting to see how expansive this renewed protection proves to be. The following is cross-posted from the Bulletin for the Study of Religion Blog. The following is my contribution to the question, “How do you define postsecularism, postsecular, or the postsecular?” This question elicited some great response from the other bloggers on the site, which you can find at Part 1 and Part 2 of this series. You can follow the Bulletin Blog on Twitter at @religionbullet. I’m not particularly attached to the term but I will consider how it might be analytically useful in certain situations. “Post-secular” might be used productively to describe a state of affairs in which those in power recognize some of the problems of a religion/secular dichotomy while, at the same time, drawing their power and authority from a system that is premised on just such a dichotomy. In this situation, those in power recognize an area of social existence called “the secular” (in which there is ostensibly no religion) and have to apply that neat framework to a messy reality. For better or worse, the most powerful theorists of the post-secular in American life are the nine members of the Supreme Court who have possessed, since at least 1947, the power to determine the particular religiosity/secularity of public spaces and acts under review. Smith involved government regulation of only outward physical acts. The present case, in contrast, concerns government interference with an internal church decision that affects the faith and mission of the church itself. It is as if the justices haves some sort of theological Geiger counter with which to take readings: how religious is the act in Case XYZ? Fully religious? Only 80%? Where’s the tipping point? This might seem absurd (it is), but it is also one practical response to the “post-secular” situation described above. Many of the benefits (i.e., exceptions to generally applicable laws) of the First Amendment are premised on an individual or institution being religious or secular. While the justices may not always see a hard edge between religion and secular, it turns out that there’s no such thing as “a little bit tax-exempt.” As Charles McCrary rightly points out in part one of this series, this is why the question of “Is it religious?”—a question which many of us are tired of hearing—remains an incredibly important and powerful question in the realms of law and policy. And I wonder whether a term like “post-secular” might help to describe these competing paradigms.